One solution is to offset your air travel emissions is to holiday closer to home. Overseas travel is one of the great pleasures of the surfing lifestyle. But it’s also one of the highest carbon emitting activities you can do besides light a bloody big bushfire. With the planet undeniably heating up and the majority of experts convinced carbon emissions are a big part of the problem, guilt free air travel is becoming a shrinking commodity. One solution is to offset your air travel emissions. Another is to holiday closer to home. Sure, domestic travel lacks the intrigue of a trip to Mexico, but if you’re chasing world class waves in a beautiful country not run by drug cartels you do a lot worse than explore your own backyard. And here’s the thing about swapping an OS trip for a domestic one: You can throw your AUDs around like their pesos. The south coast of NSW has long been a favourite escape for many tube hunters. After 20 years of exploring I’m still finding waves, national parks and pie shops worthy of celebration. Usually I camp out, stay on a mates lounge or hunker down in a grim little cabin miles from the amenities block. On a recent trip – with the family in tow - I thought to hell with all that. I wanted to stay somewhere good (okay, my wife wanted to stay somewhere good). A quick Google - south coast eco luxury escape - and we were on our way. The Long Weekend Retreat squats on three private acres of bushland near Lake Conjola, three hours south of Sydney and a short hoon from the long wrapping lefts at Green Island. It’s a well designed and tastefully decorated house that feels like a home. There’s no check in - you pick up the key by prior arrangement, let yourself in, turn on the lights and quickly familiarise yourself with your swanky new abode. There’s all the mod cons of a five star crib: espresso coffee machine, a king suite, 102cm plasma, designer furniture, fresh local produce and wine in the fridge. Plus a few unexpected touches: outdoor mineral Balinese style soak tub, chickens which supply fresh eggs and a menu from a local restaurant who will hook you up you with gourmet meals using fresh locally grown and seasonally appropriate ingredients should you not feel like cooking. Where is the eco in all of this luxury you may wonder? 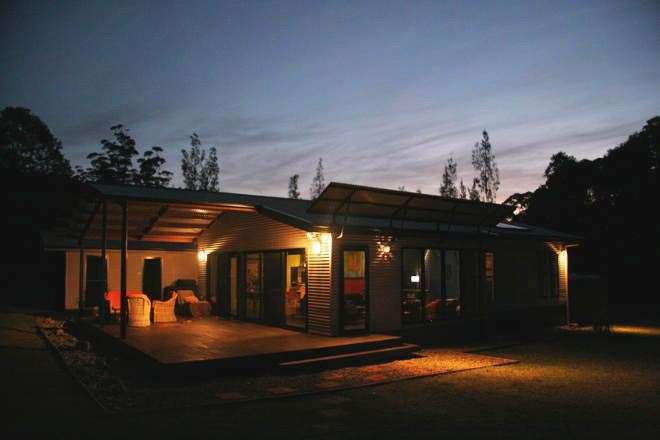 Well, you shower in rainwater heated by the sun, food scraps feed the chickens, an onsite water purification plant irrigates the orchard and gardens, power is supplied by renewable energy and passive solar design optimises energy efficiency. Plus, the secluded bushland setting encourages birdlife and kangaroos to wander about and remind you of your place in the bigger scheme of things. The lesson for me wasn’t just about a different approach to holidaying. It was a reappraisal of the whole idea that a green lifestyle has to involve deprivation. Oh, and the surf pumped too.